This page is awaiting review. This page has been queued for review and may contain grammar or spelling errors. Feel free to correct any errors you might see. See Category:Pages queued for review for other pages that still need to be reviewed. 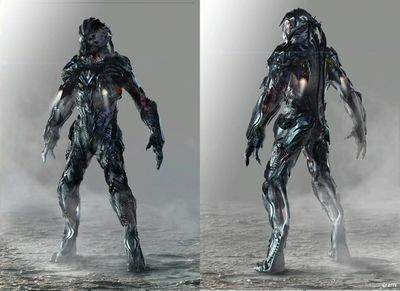 Vanduul ( /væn'duː:l/; kyexiin: äntÙR(Proper); SRX: uantūl (Proper); Vanduul: vanduul; ) are a sentient, nomadic living[Annotation 1] species of bipedal aliens. Males live on ships and form organized groups called "clans" or "hordes". The Vanduul made first contact with Humanity in 2681. Since these first encounters, they are usually aggressive towards other races, especially humans. All attempts that Humanity has made to contact them peacefully have failed. After a first big wave of attacks against the human-settled sectors between 2681 and 2712, (the Fall of Caliban, Orion and Virgil) they constantly raided UEE's "Western" border territories. Their conflict with the UEE in the Tiber System over the following 250 years lead to millions of dead human soldiers and civilians. The Attack on Vega II on 2945-10-05 caused the UEE Senate to formally declare an interspecies war against the Vanduul on 2945-11-11  and confront them in the Oberon system in 2946 (Operation Mandrake). For further information about the current war between UEE and Vanduul (2945- ), see Vanduul War. Because the Vanduul haven't contacted Humanity and are following a strict "suicide doctrine" (scuttling their ships if they are in danger of being captured), very little is known about the Vanduul as a species. Human offworld settlement in the 25th Century started during the FarStar 'push' with the result of Vega, Tiber and Virgil being discovered and colonized (with the exception of Tiber), followed by the settlement of Orion in the 2660s. No Vanduul were spotted during this period. The First Contact with Humanity was violent. On 9 August 2681, a group of Vanduul raiders attacked the Dell Township on Armitage in the Orion System, killing 638 people and abducting one human. Unusually, The raiding group looted a lot of worthless items and avoided more important ones. Since these events, Vanduul raided the systems of Orion, Virgil and Tiber System between 2681-2712, which lead to a short and rapid growth of Vega, until the system became later itself a target of Vanduul attacks. Ilyana Messer and their successors never acknowledged the Vanduul as a real threat until the following events of Orion. The UEE abandoned the Virgil System after the Vanduul attacked Virgil I, bombarding and "harvesting" the planet, leaving it inhospitable. In these events, millions of civilians on Virgil died as the UEE retreated from the system. After the end of the Messer Era, the new Imperator attempted to stop the violence and open diplomatic relations with the Vanduul, inviting them to take part in the ARK Program (2806 ff). These negotiations failed. A second push of the Vanduul in 2871 lead to the evacuation and Fall of the Caliban System. After years of relative battle silence, the Vanduul attacked New Corvo and Estilia (on Aremis) on October 5th and 6th, 2945, leading to the events of the Vanduul War. It is unknown if the Vanduul currently have a homeworld. Their homeplanet may have been destroyed or abandoned, which scattered the Vanduul clans into a nomadic lifestyle in their ships. On the other hand, it is unknown where young and female Vanduul live. Genetic analysis of X12' crew showed that all subjects had a diverse gene pool, which suggest that Hordes or Clans consist of not closely related individuals. It is possible that Clans and Hordes (which are only consisting of male individuals) are formed by a selection procedure on their homeworld and spend the rest of their life with their clan. 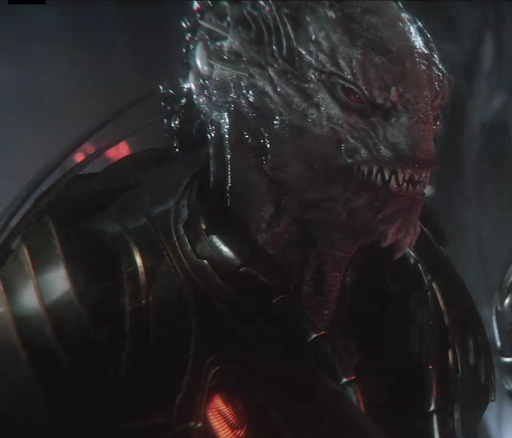 The political system of the Vanduul has been described as a meritocracy, the political philosophy in which power and wealth are given to the most talented members of a society. The disparate structure of the Vanduul civilization makes it nearly impossible to negotiate with the species as a whole, but none of the individual clans has offered anything but hostility. There is little to no communication between the different roaming clans. Each fleet operates as its own society with its own independent set of rules, laws and customs as decreed by that clan's Chieftain. As such, it is probably impossible to make peace or establish diplomatic relations with the Vanduul as a whole since there is no cohesive civilization. Vanduul do not hold permanent settlements and therefore do not claim land in their occupied systems. They eliminate every threat, raiding and pillaging the surface of an occupied planet with specialized Harvesters and then moving to a new location once the planet has been thoroughly drained of all resources. It seems that they are not interested in preserving their potential "pasture grounds", which could be a reason for their nomadic and expansionist lifestyle. 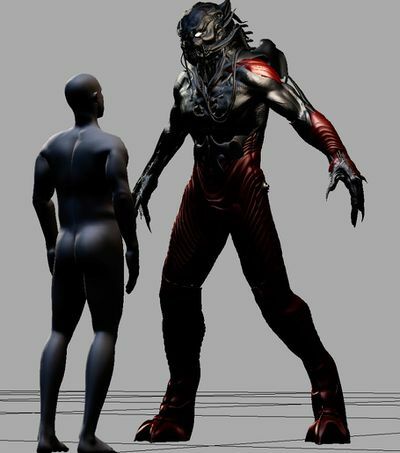 Vanduul's family structure is also very distinct from Humanity. 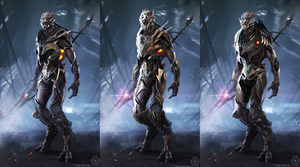 There is one tradition that exists throughout all of the Vanduul; once a child reaches adulthood (usually around the equivalent of Human 13–14 years), they are banished from their family. Before they go, the parents will fashion a knife for their child. This knife will be the child's only possession as he/she sets out into adulthood. Consequently, these knives are treasured possessions that they keep for the rest of their lives. They will receive no money, housing, or support of any kind from their former family. Everything that the newly recognized adult achieves starts with the knife and grows from there. Therefore, there is no hereditary transfer of money or influence. For unknown reasons, Vanduul don't communicate with humans. At least one System deep in vanduul space is claimed by the Banu. The Writers Guide (from 2013) points out that the relations between Vanduul and Banu are 'precarious but friendly'. Some clans are trading with planet-states. The Writer's Guide claims that there are 'a lot of unfriendly systems between the Vanduul and the Xi’an'. Some clans have trading relations to the Xi’an Empire. It is not a surprise that Xi'an view the Vanduul as barbarians, while Vanduul view Xi’an as 'manipulators and cowards'. Due to the cultural emphasis on solidarity, the idea of higher powers aiding or affecting an individual's life has never caught on with Vanduul society. Therefore, the 'self' is held in high regard, so the closest thing to a Vanduul religion is the admiration of a specific person and what he or she was able to achieve. Vanduul youth are educated in the lives of exemplary Vanduul of the past. Specifically the choices they made, and how they overcame their environment and distinguished themselves. From a purely anthropological perspective, the Vanduul behave like classic hunter-gatherers. They are a very insular species. They rarely interact with those outside of their clan, even other Vanduul. If you should find yourself engaged in a conversation (trade) with a Vanduul, they will be all business. They find engaging in pleasantries to be inefficient and insulting. In combat, the Vanduul are relentless and merciless. In a textbook raid, they will hit hard and fast and never leave survivors. Over the decades, they've adapted their tactics as they've learned the purpose of Human structures. Clans will attack high-value buildings (Communications, medical facilities etc.) first to minimize the chance of resistance. It is possible for an individual human to engage in trade with a Vanduul although it would be incredibly difficult. Vanduul have a "unified system of quasi-pictographic writing". A translation team from the University of Moscow investigated the Language, although it will take several years before the Vanduul language has been completely deciphered. The language was created by Britton Watkins. [ˈkurae ʃalˈjuve:], [ʒaˈlaθ ʔaqˈqaθ:on: ˈminːa::], [iwe:hah:ih:ohʃdavo:hpunahdoh], [ˈkai ˈfisad ˈjusa ˈkujamˌlaχ↗nu::] and [χeχo:lda:ˈvedna::]. He also pointed out that the Vanduul bodies are changed their color based on their mood. Andy Serkis has stated that the language is very guttural and harsh sounding. Note: This section includes several SPOILERS of Squadron 42 and Star Citizen storyline.
" They are scavengers. They don't create their technology, they absorb other race’s technology and make do what they want with it. So, they are really really capable in understanding how stuff works and making stuff work for them by modifying it and like combining stuff together. (...) they don't care about [visual aspects] (…) they don't have art (...) they’re just out there to basically conquer and absorb and assimilate and just be stronger. That's why their weapons(...) don't necessarily have a consistent style per se as you can very often see some other races and some other technologies inside." ↑ As a Vanduul male reaches "adulthood", he lives the rest of his life with his clan "on the run". It is currently unknown where female and young Vanduul are living and under which circumstances male and female Vanduul are procreating. ↑ A note on parallels with the Vandals, who lived relatively steadily until they were forced by the Huns to cross the Rhine (with the Alans and Suebi) in 409. Afters years of wandering they erected a shortlived kingdom in Spain, then in Carthago. In 455, followed by another roman civil war, they were invited by a roman faction to eliminate the roman usurper Petronius Maximus who was proclaimed the new emperor. He wanted to marry his son to the dead Emperor's daughter, a turn which raised resistance in the roman aristocracy. As the vandalic army arrived at the city, the roman defenders opened the gate without resistance. Petronius was stoned by the citizens or murdered by his own guard. ↑ 3.0 3.1 3.2 3.3 3.4 Chris Roberts On PC Gaming, Going To Space, Rock - Paper - Shotgun from 2012-10-27. Accessed 2016-11-03. ↑ 4.0 4.1 Star Citizen: Loremaker's Guide to the Galaxy - Vega System from 2012-10-27. Accessed 2016-11-03. ↑ 21.0 21.1 21.2 Analysis of Vanduul phonology, p.1, Tuomo Sipola, 2016. ↑ Squadron 42: Behind the Scenes - Andy Serkis, 2016-03-18. Accessed 2016-11-03. ↑ 4th Anniversary Livestream (Youtube) from 2016-11-19. Accessed 2016-11-20. ↑ 25.0 25.1 Creator Chris Roberts talks Star Citizen, The Ambitious Space Sim on steroids from 2015-03-18. Accessed 2018-08-21.